Gillian Aldridge, OAM Mayor of Salisbury I love this time of year. The weather is warmer, we’re outside more often and the events happening in Salisbury are filled with excitement, joy and fun. It’s a wonderful time to reflect on the year that was, celebrate the festive season with our loved ones and to make plans for the New Year ahead. With that in mind, we have a wonderful annual Australia Day celebration in January which will feature a free breakfast in Carisbrooke Park, with live music, a flag raising ceremony and the Australia Day Awards which we would love you all to be a part of. We are also incredibly excited to announce the headline act for the 2019 Salisbury Secret Garden as Sheppard! With high-energy hits such as Geronimo, We Belong and Let Me Down Easy, the Indie Pop band has soared to the top of the music charts. We are excited to welcome them to Salisbury as they take part in the fabulous Fringe festivities. We are also pleased to welcome The Twilight Zone – a ‘60s Legends band featuring John Bywaters, Peter Tilbrook and Rino Cufone who individually dominated the Australian charts in the ‘60s and ‘70s. The Twilight Zone will headline the Friday night Showcase at the Salisbury Secret Garden. 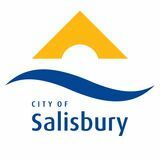 Please take the time to look through this edition of Discover Salisbury and discover the many events and activities happening right here in your own backyard. 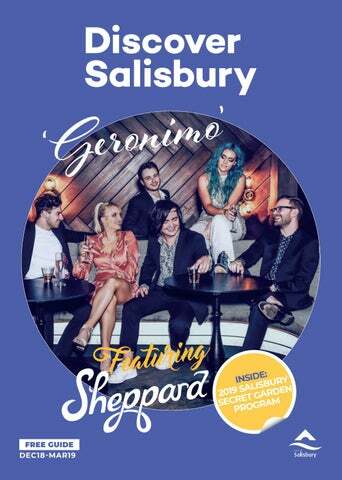 Sheppard performing in the Salisbury Secret Garden - Sounds in the Garden on 23 February 2019! Bring the family and get involved in a day full of free activities and events designed to bring the community together to have some fun in the sun. Games, food, entertainment and more will be available at the Salisbury Secret Garden northern hub of the Fringe. The aim of the ‘Well Versed’ project is to celebrate poets and poetry in Salisbury and throughout the wider South Australian Community. SAT 9 MAR | 7PM TO 9PM ARE WE THERE YET? 2019 International Women’s Day Breakfast Mayor of Salisbury, Gillian Aldridge, OAM invites you to a breakfast to celebrate International Women’s Day. After Council approval in 1989, Stage 1 (25ha) was completed in 1990, Stage 2 (12ha) in 1993 and the largest stage, Stage 3 (72ha) in 1995. Salisbury is renowned for having some of the best wetlands in Australia. With more than 114 hectares throughout the Salisbury area, there are plenty of places to explore. The wetlands have a natural beauty and an exciting history. Discover some of the 160 reported bird species, frogs, fish or fauna onsite. Discover relaxing boardwalks for peaceful walks, coastal wetlands for prime bird watching, and wetland cafes for a quick coffee after discovering the natural beauty of this unique landscape. This area of land has become home to over 160 species of birds, eight species of fish, four species of frogs, yabbies, long-necked tortoise and numerous aquatic invertebrates. The wetland trail is accessible from 8.30am until 3.30pm daily. An access token to enter the wetland trail can be collected from the Watershed Cafe by providing photo identification and a $20 refundable deposit . Greenfields Wetlands came into existence in 1984, when the City of Salisbury prepared and approved the initial concept of developing 42 hectares of low-lying saline land into a stormwater detention basin and wetlands habitat. More than 25 species of aquatic plants thrive in Greenfields Wetlands. Self Guided Tours The self guided tour takes about 40 to 60 minutes to complete. Interpretive signage along the trails provides details of the rich and diverse wildlife. Guided Tours Guided tours of the Greenfields wetlands are available for community groups, sporting clubs, Scouts, and small groups of people upon request. Tours are subject to availability and bookings are essential. Through a guided tour your group may learn more about the history of the Greenfields site, see and hear some of the bird life, learn about the wetlands and the natural water cleansing process and the Aquifer, storage and recovery process.